With the beginning of June came the half-way point for the first year of MIPS reporting. While many providers haven't started reporting yet, a good number of clinicians have started early. 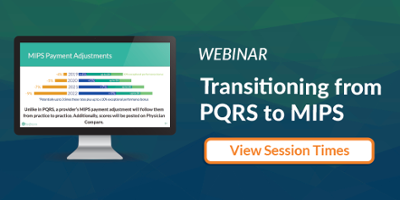 We interviewed clinicians and practice administrators who have reported PQRS in the past via registry, are currently reporting through the MIPSPRO registry, and that represent a diverse demographic of MIPS eligible clinicians. Clinicians who have a fair amount of experience reporting PQRS (3-4 years) have found MIPS to be very similar. The biggest change they noticed was the increase in data that needed to be submitted. Additionally, they favored the more flexible pacing options offered for the first year of MIPS, and have felt that having reported PQRS in the past helped them acclimate to the new program. With the increased measure data requirements, large practices found that manual visit entry was impossible. Instead, they preferred to upload their data to the registry using an exported spreadsheet from their EHR or some other form of importing data. Additionally, large practices have found that organization is key! Constant staff additions and the increased reporting requirements makes keeping data relevant to MIPS reporting very important. However, being able to report for 90 days instead of a full year has helped ease some of that burden. Since CMS is prone to changes in policy and the MIPS final rule is both new and difficult to navigate, large practices are assigning a staff member to focus on learning and staying on top of MIPS policy. They've found it takes some of the pressure off this MIPS expert-in-training that penalty avoidance is pretty simple this year. Where small practices also see the value of having a staff member focused on MIPS, they do not have typically have the staff to support this. Instead, small practices rely on the system to guide them, an accessable MIPS support team, and implement a weekly schedule for staying on top of data entry. Many practices have also customized their patient encounter forms to streamline to process of data entry. Small Practices also appreciated having access to all three Performance Categories through one interface on MIPSPRO. As the process of MIPS reporting is already overwhelming, having only one place where data is to be entered and scores are to be displayed is preferrable. Through all of our interviews, there were a few best practices that were consistently recommended. 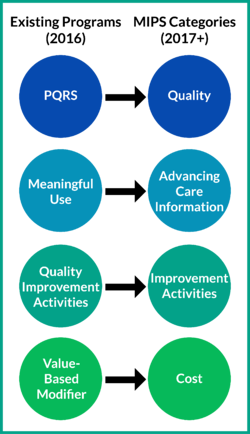 The aim of MIPS is to streamline CMS's quality reporting programs to enable a smooth and meaningful transition to value-based care. The current Administrator of CMS has stated that it is her priority to develop MIPS and other value-based programs to the point where they are not a burden to practitioners, while managing to identify and bridge gaps in patient care. From the interviews we conducted, it sounds like CMS has taken the first step in the journey towards meaningful innovative payment models.